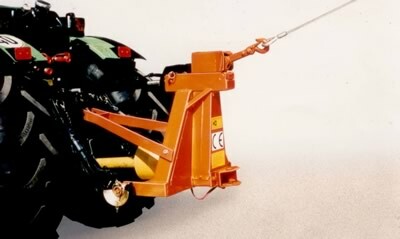 The Shuttler is an economical tree shaker that is mounted on a tractor’s three point linkage. A wire rope fixed to a crankshaft on the shaker is attached to the tree to be shaken. Trees of all sizes can be shaken, from the largest standard tree to the youngest bush tree. The Shuttler’s compact size and high quality construction have made it the most popular wire rope tree shaker in Europe. The pivots and joints are made from case-hardened steel. The main crankshaft is fitted with long lasting heavy duty double row ball bearings. The wire rope is attached to the shaker with a special spherical joint. This minimises shackle wear and backlash. It is available with a choice of wire rope lengths. Output in bush orchards can be can be increased significantly if two ropes are used when working in bush orchards. The Shuttler is light and easy to handle and transport.